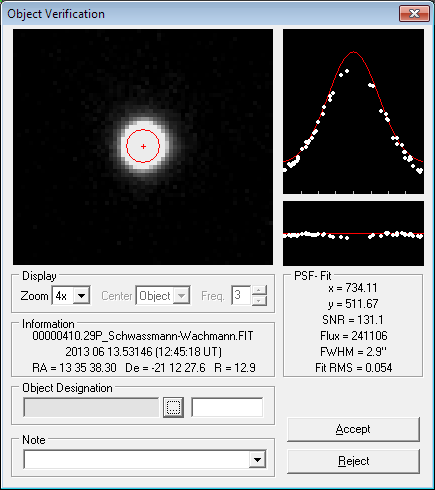 This page contains photographs of Comet 29P/Schwassmann-Wachmann. 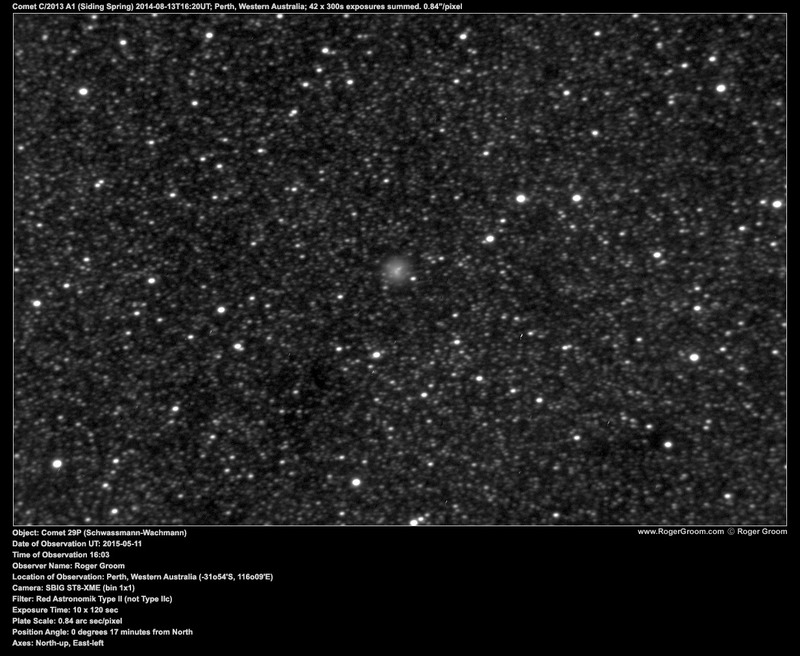 Below is a Vimeo video containing 15 frames captured over the period of June – July 2013 showing the outburst of comet 29P/Schwassmann-Wachmann. The image quality is somewhat degraded by video compression and trying to make each frame normalised to produce a smooth video rather than optimising each frame for its own conditions. Moon glow and other factors affected the image quality. 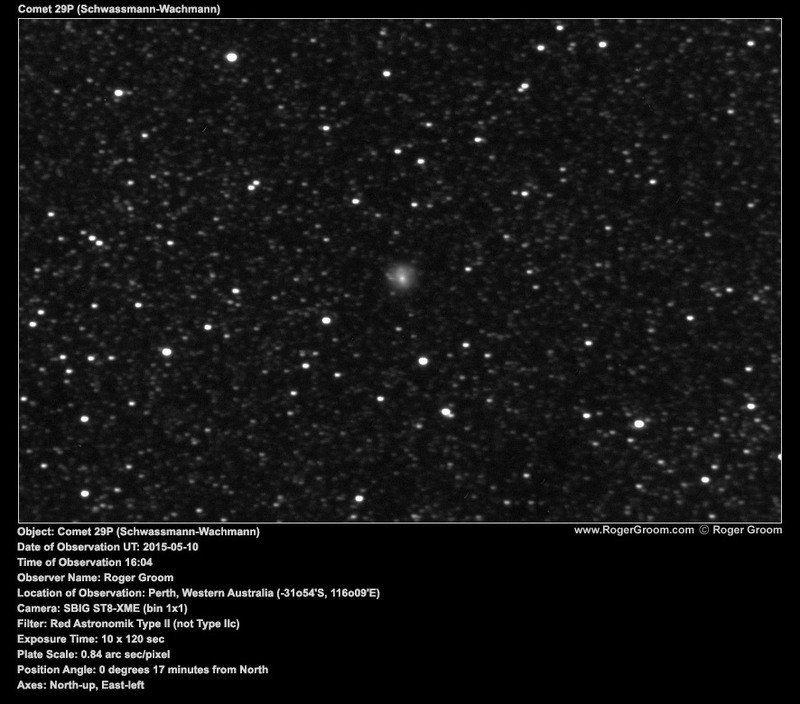 Comet 29P Schwassmann-Wachmann June-July 2013 Outburst from Roger Groom on Vimeo. 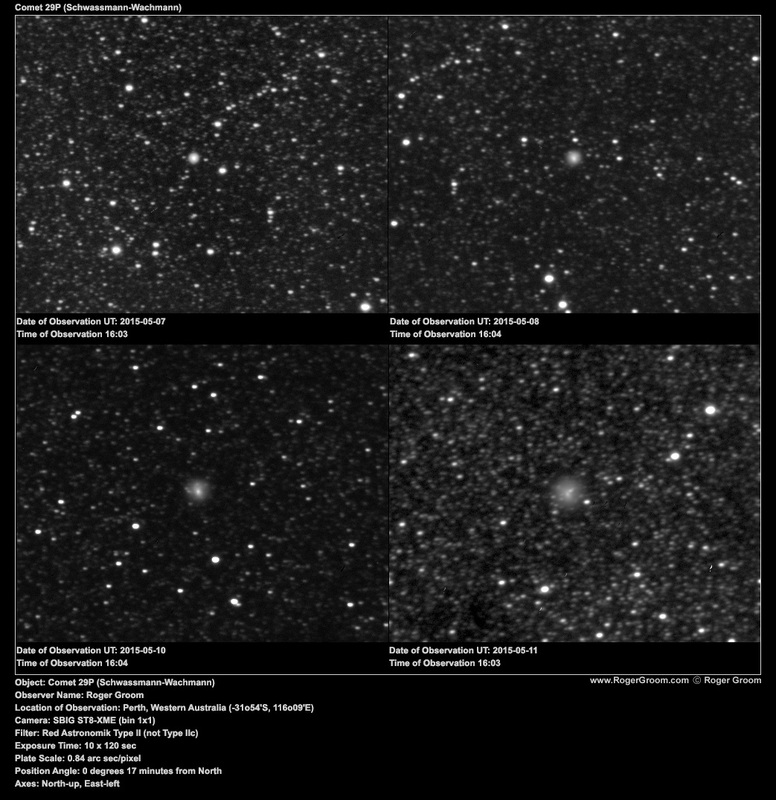 The remainder of this page contains photographs of Comet 29P/Schwassmann-Wachmann starting from June 2013. 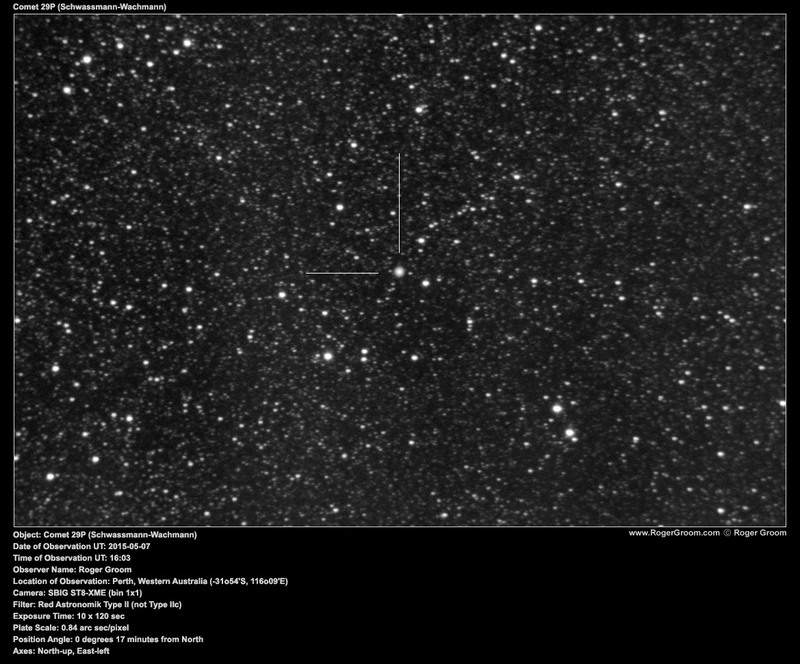 On the 19th June I took the usual sequence of 5 x 180 second exposures. 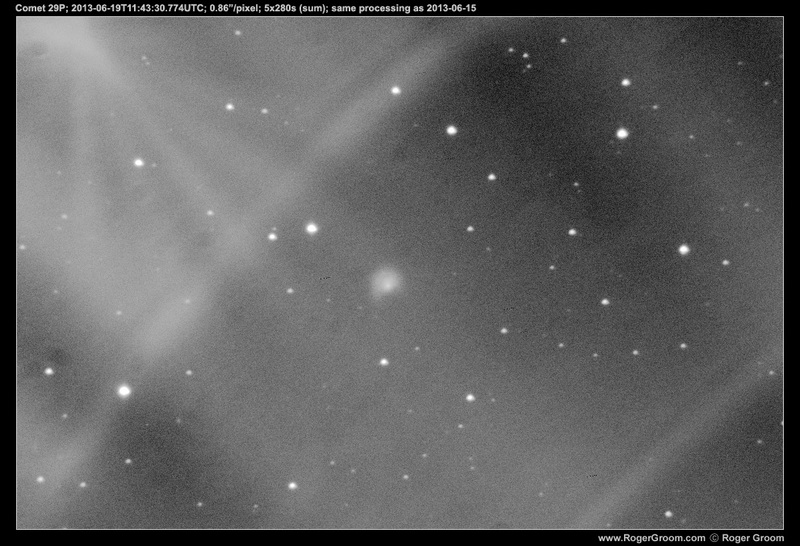 The first image shown here is processed with the exact same curves & levels as the image on the 15th June below these. 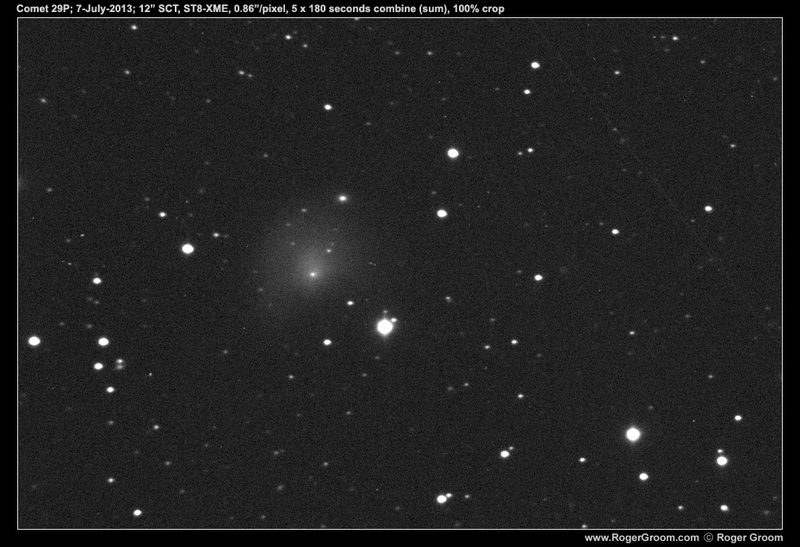 You can see variation in the comet, that it is now less centrally bright and instead has a wider area immediately around the nucleus (sorry for my lack of scientific language!). 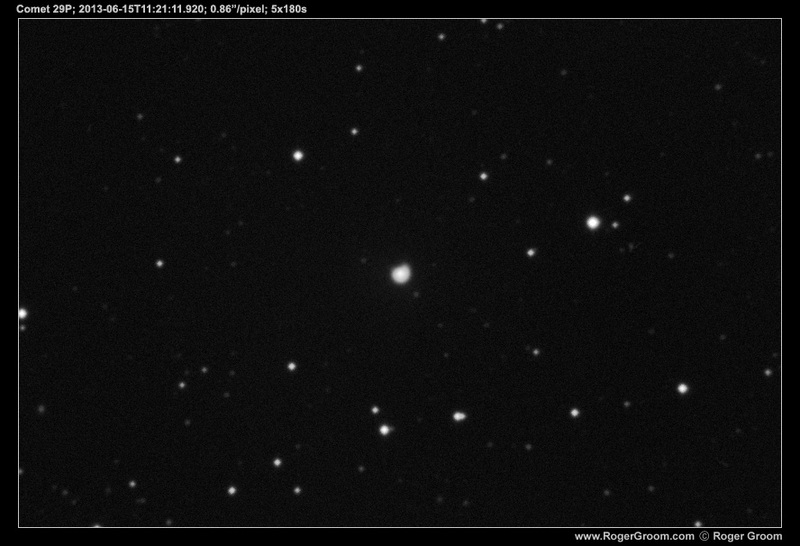 The second image is the same stack from the 19th processed differently. All images are at the same 0.86 arc seconds per pixel scale and all are crops of the 100% images (not resized), providing you click the images below to view the full size file. The light distortions across the image are from the Moon which was 10 degrees away. 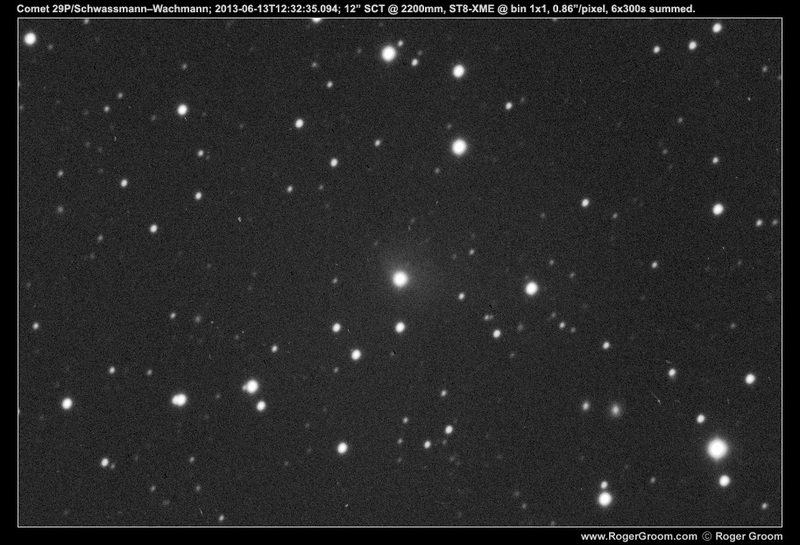 Comet 29P; 2013-06-19T11:43:30.774UTC; 0.86”/pixel; 5x280s (sum); Processed the same (same levels, same curves) as the image from the 15th, for comparison. The light distortion is from the bright moon nearby. 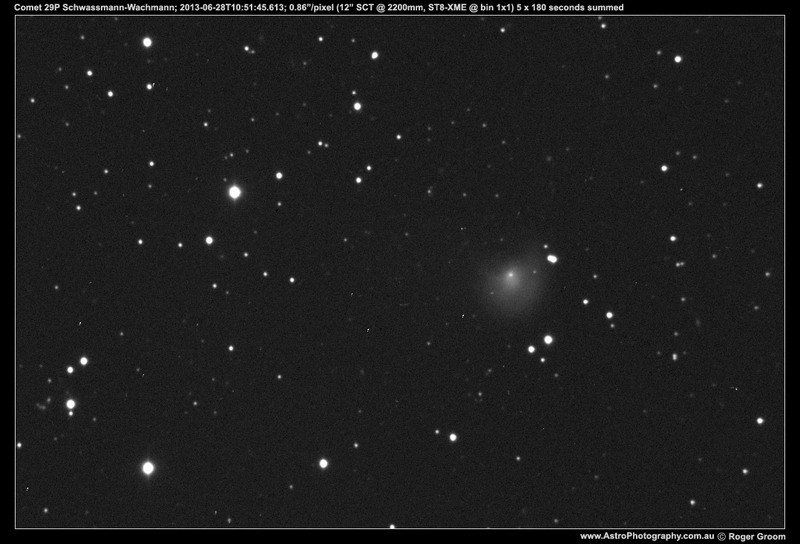 Comet 29P; 2013-06-19T11:43:30.774UTC; 0.86”/pixel; 5x280s (sum); Reprocessed. The light distortion is from the bright moon nearby. 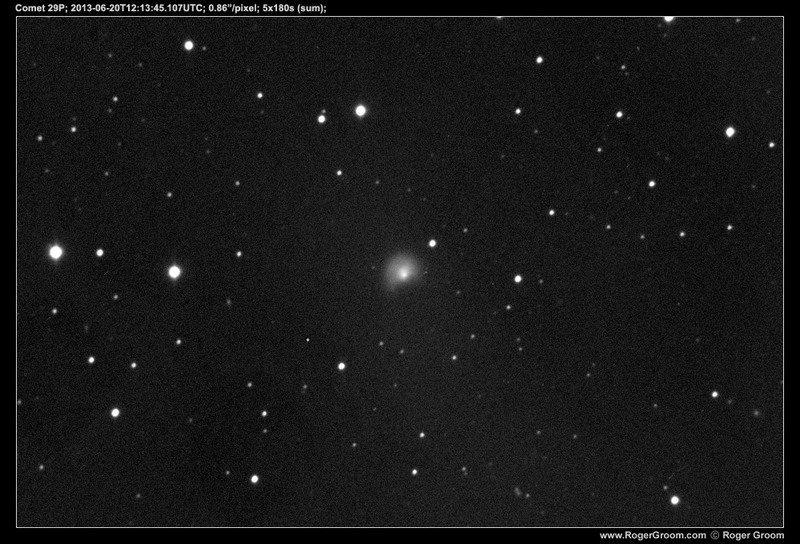 Comet 29P; 2013-06-15T11:21:11.920; 0.86 arc seconds/pixel; 5x180s. Moon present at approx 40% illumination. Comet 29P/Schwassmann–Wachmann; 2013-06-13T12:32:35.094; 12” SCT @ 2200mm, ST8-XME @ bin 1×1, 0.86”/pixel, 6x300s summed. Image has been cropped. I’m no expert with photometry or astrometrica but I simply had astrometrica plate solve this image then I clicked on the comet. I read from the result a brightness of 12.9. But being a comet rather than a star, I suspect this is wildly inaccurate. The photograph was taken through a clear filter on an ST8-XME.